Dare I tell you, Dear Reader, that I did not love Cherry Jones’ performance as Amanda Wingfield in Tennesse Williams’ The Glass Menagerie on Broadway Saturday night? I am not a Williams aficionado and if I ever read or saw Glass Menagerie, I only have a vague notion of it. But Ben Brantley’s review of the production during its initial run in Cambridge caught my eye. He used words like “magnificent,” “benchmark performance,” and “momentous.” I had to see it. After all, I was an English major and I fancy myself a sophisticated theater-goer. In my post-midlife enlightenment, so much now seems resonant with meaning that I didn’t appreciate when I was younger or don’t even remember. Maybe it was time to discover Tennessee Williams. I became mildly obsessed with seeing this production. First, I flirted with trying to see it in Boston. We were visiting schools – could I squeeze it in? I didn’t make it a priority. It didn’t happen. Then I heard it was coming to Broadway, with opening night on my birthday. I fantasized about going on opening night. I didn’t make it a priority. It didn’t happen. 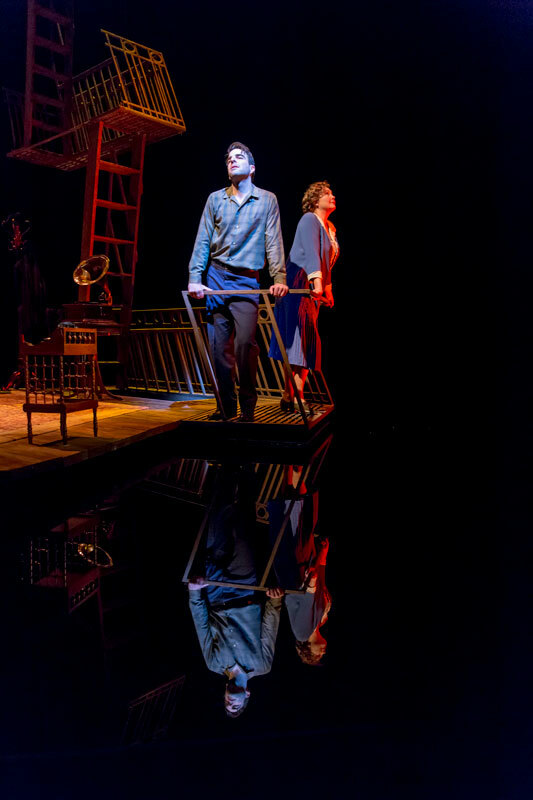 When my husband asked me what I wanted for my birthday, I told him: “I want to go see Glass Menagerie with you.” It is rare that I am so specific with my requests. I took this as a positive sign of my increasing comfort with my knowledge of who I am and what I want. This led to an on-going discussion between us about gift-giving. He wanted to give me something more permanent, like jewelry, to mark the occasion. I was happy with a memorable, if ephemeral, experience. Plus, what I really wanted was recognition of my theater self and participation from him in my world of passions. I have joined him in his world of passions. Now I wanted him to join me. I almost didn’t make it a priority. It almost didn’t happen. Opening night came and Ben Brantley gave it another stunning review, warning us “to be prepared to have the breath knocked out of you.” It was going to be a sell-out. I made it a priority. We got one of the last few remaining tickets. Good and compulsive English Major that I am, I decided I better read the play before seeing it so I would fully appreciate the production and the language. I didn’t love it. It was dated. It was depressing. (This from the woman who practically thrives on depressing and tragic.) No matter, I reassured myself! The production is magnificent and momentous with benchmark performances! I even got a second opinion from Hilton Als in The New Yorker who praised the production. I was finally going to see one of the greatest stage actresses of our time perform one of the greatest of roles. Truth be told, I really wanted to see the handsome Zachary Quinto. My husband was not psyched about seeing a depressing tragedy but he was psyched about seeing Spock. Denying a hint of misgiving, off we went. “Are you excited?” He asked, eager for me to enjoy my ephemeral birthday outing. “I am!” I reassured him. I was truly excited for a date in the city to dinner and the theater with my husband. We had a not-great dinner at what was usually a reliable pre-theater restaurant. Pre-theater is so taxing on restaurants. It’s like a factory. Get them in, feed them fast, get them out on time. Oh well. I mentally crossed that restaurant off my list. Never again. Too bad. It had been a favorite of mine years ago. We walked over to the theater, amazed at the Times Square crowds. I am there every day, but Saturday night is a different experience entirely. Filled with tourists being snookered by costumed mascots and street performers, we looked askance at each other. “I guess the economy is improving,” my husband declared. We got to the theater and took our seats. Remember, they were some of the last seats available. Still, when Quinto gives his opening monologue, we are seated so far to the right that we can’t even see him. It takes a bit to acclimate to his southern accent, but no matter! The words are poetry. The set is spare, the lighting is beautiful. When Cherry Jones enters, the audience applauds. A diva has arrived. I am anticipating the pleasure of experiencing a master of her craft at work. Indeed, she is a master of her craft and that is the main thing I was aware of the whole evening. Her presence was so enormous, her accent so thick, her tone so loud. “Look at me act!” was my general impression of her. The reviewers credited her with interpreting Amanda Wingfield with more balance and nuance. Really? Balance and nuance? It was not in abundance Saturday night. Amanda is a narcissist who has monstrously damaged to her children. Amanda is terrified of being old and poor. Amanda is a struggling single mother who wants a better life for her children and is frustrated by their lack of a future that she deems worthy. I would have liked to have seen some quieter moments where she turns her volume down and you see some love and some wisdom. I found it in the play. But it didn’t come across in her performance. The main emotion from her was self-absorbed denial of reality. Fortunately, Quinto was excellent, even though I didn’t like his southern accent. For me, the stand-out performance of the night was given by Brian J. Smith as The Gentleman Caller. The scene between him and Laura is one of the most touching almost-love scenes ever. It was disconcerting to walk out of the theater and acknowledge: I did not love it. I wanted to love it. I had primed myself to love it. But I did not love the show. I did not love the play. I did not love the performances. I was not beyond tears as Ben Brantley was. What was the matter with me? I am so eager to identify myself as esoteric, to revere the classics and to trust the critics (they are experts after all). But I don’t really love the classics. Tedious and boring. Written by men mostly. I prefer contemporary works, by women. I recognize the characters and can identify with their situations. I don’t have to work to remember. It sinks more naturally into my psyche. Maybe Ben Brantley performed Tom when he was in high school. Maybe he has a nostalgic soft spot for the play. Maybe he has seen it so many times that the anticipation of the poetry and the emotion moves him to tears. Not me. At least not Saturday. Nothing is the matter with me. Cherry Jones gave an overwrought performance and the play is dated. Moving, but dated. Time to move on and acknowledge that I don’t really love the classics. What I do love is that I am excited about this growing confidence building in my gut. I did not love the dinner nor the show, but I did love the evening, a memorable and not-so-ephemeral birthday gift. Yay!! You believe your own experience more than ‘the experts’. Wonderful!! Happy Birthday!